When weaning your baby off liquids and on to solids you want the food to be as nutritious, additive free and chemical free as possible. Ideally every parent would like to feed their babies organic food only, but the stuff you find in stores can be a little expensive. Rather than opting for jars and processed varieties why not make your own homemade organic versions?It's all about finding the best base recipes and adapting them to meet your child's tastes and health requirements. Organix is a great site that offers parents easy, ‘junk free' recipes and meal planners - organic style for your new borns. Recipes like the Potato and Spinach Cheesy Dinner provide plenty of essential nutrients (like iron, zine, folate and vitamin C) for growth and development. Tasty recipes like this one can also be enjoyed by the whole family, making your life easier when it comes to preparation time and sourcing baby-friendly organic produce. By making your own baby food you know exactly what your baby is consuming plus you save on packaging and of course money. If you make enough to freeze, use ice block trays so that you can take out exactly what you need each feeding time rather than defrosting whole bags. 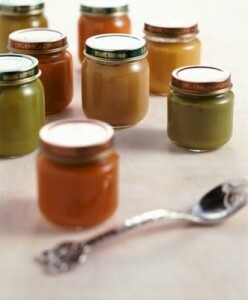 Also remember to sterilize the jars and containers you store baby food in and feed fresh (freshly made or freshly defrosted) to avoid overgrowth of bacteria.